Vancouver, British Columbia–(Newsfile Corp. – February 12, 2019) – Forum Energy Metals Corp. (TSXV: FMC) (the “Company” or “Forum“) announces a financing of up to 10,000,000 units at a price of $0.05 per unit to raise up to $500,000 to commence initial preparations for a summer drilling program on its Janice Lake sedimentary copper/silver project and for working capital. The units will be comprised of one common share of Forum and one warrant entitling the holder to acquire a further common share at a price of $0.10 for a term of 3 years. Forum may pay finders’ fees in connection with the financing in accordance with the policies of the TSX Venture Exchange. The financing remains subject to the acceptance of the TSX Venture Exchange. The Company also announces that, in accordance with the Company’s stock option plan, it has granted to Mr. Tennent-Bhohi incentive stock options to purchase up to an aggregate of 250,000 common shares exercisable on or before February 12, 2024 at a price of $0.10 per share. In 2018, Forum completed a highly successful first pass drill program at its Janice Lake sedimentary copper/silver project. 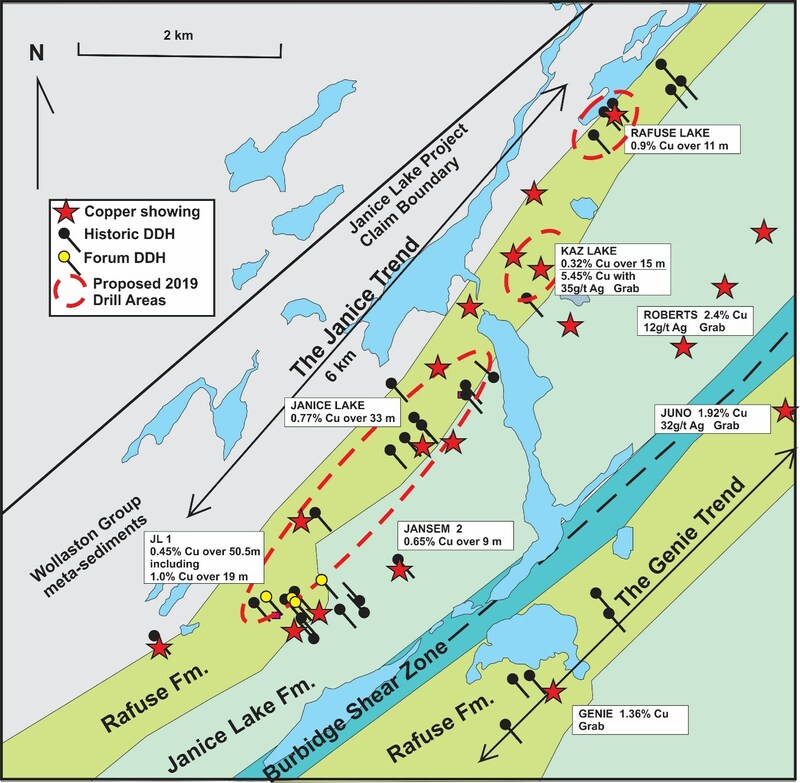 All 4 drill holes intersected shallow chalcocite, bornite and native copper mineralization above 80m in depth, including Hole FEM-01, which intersected 19.0 m grading 1.0% Cu and 6.5 g/t Ag. Logging of the drill core and petrographic studies suggest that the mineralization is hosted by mafic-rich stratigraphy within more felsic units, opening the possibility for multiple layers of mineralization within the formations. Mineralized drill holes up to 1km apart across strike suggest that the mineralized strata is at least 500m thick. To test for this scenario, Forum’s technical team has proposed a series of drill fences across multiple high priority target areas identified along a 6 km mineralized trend (the Janice Trend) for drill testing in 2019 (See Figure 1). In addition, the Genie Trend, which parallels the Janice Trend, appears to be a repeated section by faulting of the prospective stratigraphy, significantly expanding the resource potential of the Janice Lake project. Forum has received expressions of interest from various parties, some of whom have initiated due diligence reviews. Ken Wheatley, P.Geo. and Forum’s VP, Exploration and a Qualified Person under National Instrument 43-101, has reviewed and approved the contents of this news release. Disclaimer: This is an unedited and minimally reviewed public mining company press release originally published at http://www.newsfilecorp.com/release/42765/Forum-Announces-Financing-and-Appoints-Director. We have linked to our knowledge base articles from within the content of this release in order to help explain some of the terminology used and provide continuity from previous and related news coverage. You can access more in-depth mining company project reviews on our site, as well a knowledge base of articles on mineral exploration, mining and geology-related topics.